Moussaka. The best Moussaka I’ve ever had was in ‘a diner.’ The kind of diner you find in CT or NY, that are open all night, where you can order fried eggs, t-bone steaks, pancakes, cocktails, Moussaka (or hundreds of other dishes)…any time of day. Every time I visit my sister we have at least one meal at a diner, doesn’t matter which one because they’re all good, and most often I order Moussaka. The easiest way for me to explain this dish is to refer to it as Greek Eggplant & Lamb Lasagna with a really rich cream sauce on top. The truth is it’s nothing like Italian Lasagna except that it has layers. Let’s talk about the layers, as they are what make this dish so rich and heavenly. They are also what make it a bit time consuming to make (but oh soooo worth it). Like any ‘classic’ dish, the Moussaka recipe variations are endless beginning with whether or not to add potatoes and whether to peel the eggplant. I love the potato layer, it creates the bottom ‘crust’ if you will. And for the eggplant, peel it or not, your call, but I’m breading mine like I do for Eggplant Parmesan. I mean really, we’re going to top this whole dish with an inch of bechamel sauce, we’re not tracking calories. I prepare Layer #1 ingredients first, and sometimes the day before. Recipes I’ve read say you can use ground lamb or ground beef. To me, the lamb is a key ingredient, but I’m sure it would be lovely with ground beef as well. Having said that, the seasonings are another of the many unique features of Moussaka. Cinnamon, allspice, and oregano combine with onion, garlic, tomato paste, and red wine in this lovely meat sauce. This too can be made the day before as a time saving step. Bechamel Sauce, egg yolks and all, turns a great dish into a ‘classic’ masterpiece. Ladled generously over the top of this layered dish, the bechamel sauce creates an almost souffle-like finish. Incredible. This step however needs to be done in real time just before assembling the dish for baking. Before deciding whether or not I would even tackle a ‘Moussaka Post’ I ready many recipes. I chose to follow this one from Simply Recipes because her step by step instructions are always so helpful and it sounds delicious. I made just a few changes AND cut the recipe in half. The original recipe serves 8. The recipe below will make 4 generous servings. Cut eggplant into ¼-inch thick slices, place in single layer in colander, sprinkle with salt and allow to drain for 30 minutes (during this time prepare the meat sauce). Rinse off salt then press slices between paper towels, removing as much excess moisture as possible. Dip each slice in beaten egg and then breadcrumbs. Pan fry slices in olive oil until browned on each side. Reserve. Boil potatoes until just fork tender. Allow to cool. Remove skins, cut into ¼-inch thick slices. Reserve. Grate Parmesan cheese and reserve. In a 12-inch skillet over medium heat, saute onion in olive oil until translucent, add in garlic and saute another minute. Add in lamb and seasonings and cook until meat is cooked through. Add in tomato paste and wine, cook for an additional 5 minutes. Reserve. In a medium heavy bottom sauce pan over medium-low heat, melt butter. Once completely melted whisk in flour until well blended. Slowly pour in milk, whisking continuously as the sauce will become very thick until all milk is incorporated. Increase the temperature to medium and add in the salt and nutmeg. To temper the egg yolks so they won't scramble when added to the hot sauce, beat egg yolks in a separate bowl and add a ladle of sauce to the yolks WHILE whisking. 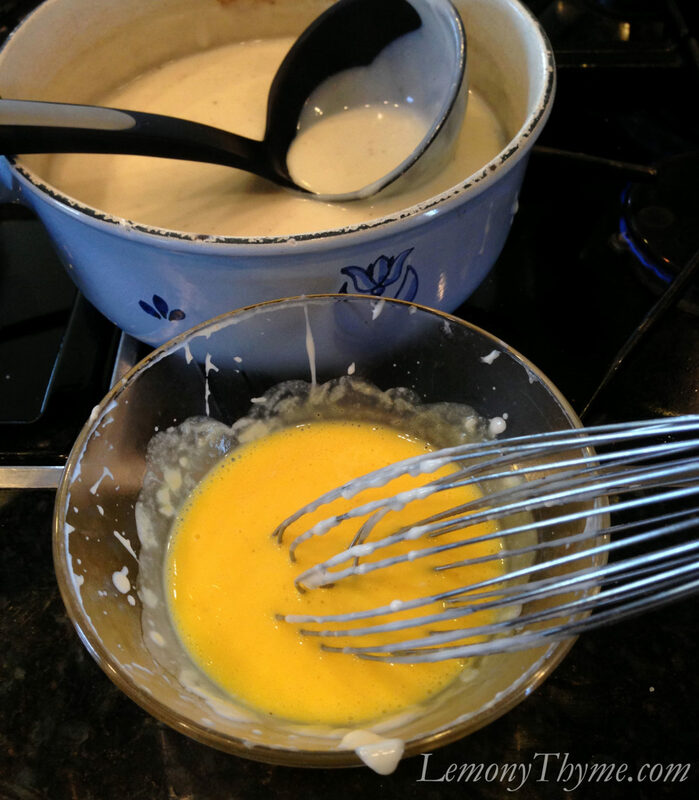 Once combined pour egg mixture back into sauce and whisk well. Reduce the heat to the lowest temperature, do not allow to boil. Preheat oven to 350 degrees. Coat an 11x7 or 9x9 pan with cooking spray. Line the bottom of the pan with a single layer of potato slices, overlapping slightly. Top with a layer of eggplant slices, then add the meat sauce, top that with any additional eggplant slices. Sprinkle with half of the Parmesan cheese. 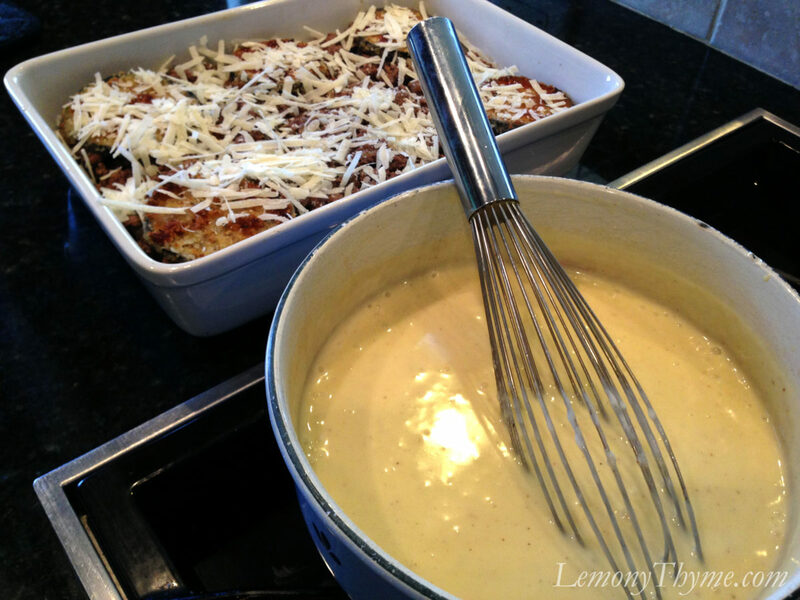 Ladle the bechamel sauce generously on top, then sprinkle with remaining cheese. Bake for 35 - 45 minutes until top is golden brown. Allow to rest at least 10 mnutes before serving. I’ve always wanted to try Moussaka but I never did :( YET! This recipe looks delicious. It looks like it requires some work but I think it’s worth trying :) Great step bu step pictures! You’ll love it Kat. Every layer has it’s own personality. It does take some time to come together. If you can make any of the layers ahead of time, like the eggplant slices or sauces that will help. Let me know how you like it. I was so craving Moussaka about 6 weeks ago,I am 33 weeks pregnant and traveling back to US for delivery…this recipe will go onto my list of foods to make ahead and freeze for after baby gets here. The recipe I use has utmeg in it too, just some food for thought! wow, its look so yummy!